The flight season for the dragonflies, damselflies and chasers is long over in the UK as I write this on a gloomy, windy November afternoon. But sure enough they’ll be back in a few months, buzzing around our rivers, ponds and wetlands as they have been for over 300 million years. Among them is the focus of this week’s creature, the Common Darter Sympetrum striolatum. As well as being stunningly beautiful in it’s scarlet livery, this species is a photographer’s favourite due to it’s ambush techniques of catching prey. This particular individual was sitting spread out on a dead tree at my local water meadows, and so fixed on it’s task that it wasn’t bothered much by me and my macro lens. If any small, flying insect is to appear in range, the darter shoots out like a spring, chases, catches, and eats: And then it returns neatly to the same perch, to wait for another very unlucky fly. To the insect world, the term ‘dragonfly’ cannot be more appropriate when attributed to these supreme predators. For the handyman of the bird world, look no further than the Hammerkop Scopus umbretta. In fact, handyman is the wrong word. ‘Shipbuilder’ is probably more appropriate, as this wader of African & Malagasy wetlands holds the record for the heaviest nest. These enormous structures can reach almost 2 metres in length and be comprised of over 10,000 sticks, and are capable of supporting a man’s weight quite comfortably. 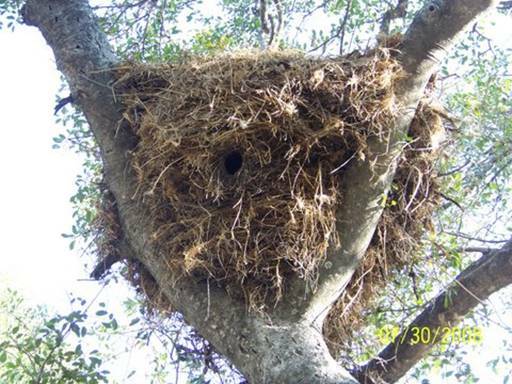 The exhaustive effort of constructing it is rewarded with a far more secure place to roost and rear eggs, with the nest itself being a cavity within accessed through a small hole. This security afforded can also be its weakness however, with other bird species’ such as barn owls being known to evict the previous occupants and take up residence instead. Bar it’s huge, hammer-like bill that gives the bird its name, the hammerkop at first glance may seem like just another common-brown-job of the wading birds. But this great feat in behavioural evolution just adds to a myriad of examples in nature as to why organisms shouldn’t be judged by appearances. Undoubtedly, crocodiles are one of the planet’s most tenacious predators: The first set of hungry eyes, peeping from the river’s surface at the same time as the dinosaurs dominion, and then surviving virtually unchanged in for the millions of years that have since passed. So successful are they at the role they play in their environment, that evolution has only made marginal changes to their morphology and behaviour in this time, whilst they’re prey on the land carries on changing completely hundreds of times. And yet, this mastery of evolution that has survived the most dramatic of ecological catastrophe, is meeting it’s match with one species alone. Guess which one? Subsequently, the Philippine Crocodile Crocodylus mindorensis is one of 7 out of 14 crocodile species listed as threatened by the IUCN. More specifically, it is listed as ‘Critically Endangered’, numbering only 250 in the wild and on the very verge of extinction. But while it is easy to get conservation support for tigers and mountain gorillas, few people are willing to help an animal which essentially represents humanity’s fear of nature’s ‘dark’ side. And, along with habitat loss from drainage for agriculture, this is one of the key reasons why it’s in its current state. Though it is a small species and more wary of humans than some of its larger relatives, locals still kill it indiscriminately out of paranoia. When the country’s government doesn’t even support conservation measures for the animal, it seems as if the captive population may be the last remaining vestige of this remarkable reptile in the near future. But with biodiversity slowly growing on the agendas of many of the world’s leaders, as the effects of it’s loss on our own livelihood become more apparent, let us hope that millions of years of perfected evolution isn’t wasted for the Philippine Crocodile in the time to come. Or indeed, all of its remarkable kindred. It’s unlikely you’ll find photography portfolios, wildlife documentaries or any form of public support for the Castor Bean Tick Ixodes ricinus. Not surprisingly, this is due to its lifestyle of waiting on exposed vegetation,such as this bluebell, for passing mammals to fix its mandibles into, be they dog, deer, human; anything fleshy and warm-blooded is on the menu. The tick can stay attached to its host for a few days after this, gorging on their blood till it is so bloated that it looks like a different animal entirely, like a swollen pebble on legs, resulting in it finally dropping off and leaving behind a painful sore. Sometimes this includes lyme disease, making it more of a concern than just an irritating hitchhiker to the woodland rambler. These credentials make this arachnid a much resented part of our fauna, especially among those like myself who live near or spend much of their time in woodland. The body check for ticks at the peak of their season isn’t always successful (and I have had ticks in particularly bad places, which I don’t feel I need to explain! ), and when you have a dog there are times when he seems more like a living bus doubling as a blood-bank for the parasites. But whilst they may be a nuisance, at the end of the day they are just another part of the woodland ecosystem, and like every other organism we share our planet with should still be seen through an unbiased filter of respect for, quite simply, what it is. Even if it is pretty hard in this case. In fact, I’d say the great thing about ticks within a human context is they remind us nature isn’t all squeaky-clean and disney-fied. They’re one of the few things that literally gets us back in place with nature the moment they hitch onto our legs, and as a result allow us to directly contribute to the ecosystem. I’d still recommend covering up your limbs when going in the woods or long grass, and if you do get one, get it off quickly. If it’s already bitten, tug it off with tweezers by the head, not body, so no parts of the animal are left in the wound, and if it’s been there for a long time, make sure the wound doesn’t get any bigger. If so, lyme disease is a possibility. Or conversely, enjoy the feeling of being part of nature’s food chain! Even if you live in the UK, it’s unlikely you’ve ever seen a sand lizard; and not just because, like most of our reptiles, they are incredibly skilled at staying hidden when they sense our trampling feet nearby. Lacerta agilis is the victim of huge population decline across the whole country, due to the loss of its sandy lowland heath habitat. A complicated place for these guys to live in, firstly because it’s largely plagioclimatic, i.e. it is a habitat maintained by man. The acidic soils mean few plants can grow on it, but among them are bracken and birch, and as they grow and add dead-organic-matter to the soil it becomes easier for the area to revert to woodland: However, grazing by livestock in days gone by prevented this and created the heathland. But as agriculture became more specialised, this became less common. And whatever heath was left would often fall to the second problem: To the non-naturalist, lowland heath appears bare and derelict. Perfect for a new housing estate or golf course. These factors (along with regular heathland fires, often by kids doing it for fun) meant that by the 70s, sand lizards were confined to a few isolated heaths in Surrey, Hampshire and Dorset. Thanks to the work of Amphibian & Reptile Conservation however, thousands of sand lizards have been bred in captivity and then released to former and new sites across the country, with over 200 regularly been released each year. The sites were sand lizards are present or reintroduced are then carefully managed, ensuring every requirement is met: From open patches for basking to sandy areas in which to lay their eggs. Whilst the sand lizard is doing better, it is still a rare species given full protection by the Wildlife & Countryside Act, and I was only allowed to take the above photograph as I was in the company of a licensed member of ARC. The individual here is been re-released onto heathland in Dorset managed by ARC, and was one of many reptiles I saw that day (including the equally rare Smooth Snake) as part of their Friends Day last week. For all the fantastic work they do with sand lizards and the rest of Britain’s herptofauna, they deserve far more attention, and if you are not already I hope you’ll join up as a member. The Sand Lizards will definitely appreciate it! “Classic LBJ with little or no defining features” would be a typical reply from a twitcher if you were to ask about the Garden Warbler Sylvia borin. Yet when one considers the tremendous journey these birds undertake every year from Africa, alongside the rest of its warbler kin, hirundines, nightjars, hobbys & cuckoos just to name a few of what makes up pretty much half our total birds for part of the year – and all seemingly innately – what it lacks in what we decide to call ‘physical features’ is more than made up for by this incredible feat. And they don’t stay too long either, just two or three months after arrival in April or May before they decide to head back in mid-summer. Seeing songbirds singing at the top of a bush through a pair of bins is one thing, but seeing them so close in the hand of the ringers puts a whole new dimension on your admiration for them, as detail to they’re beauty they would never normally allow you to see in their element become clear; far more delicate than you would’ve previously thought, and thus only increasing admiration for the journeys many undertake. This Garden Warbler was among a tally of 13 species caught in mist nets on a chilly May morning at a bird ringing demo I attended at Winnall Moors. An increasingly important technique, not merely for scientific curiosity anymore but serious conservation-based research as the number of migrants reaching our shores continues to fall. So while they may not be our most ubiquitous birds, it may well be a case of you-don’t-know-what-you-had-till-its-gone for the Garden Warbler.